Founded in 2007 by Joel LaPalme, Joel LaPalme and Associates Inc. is a sales and marketing company. We focus on helping manufacturers partner up with the right distribution, wholesale and retail channels, making sure that the products end up in the cupboards of every household in North America. Our cornerstone is the knowledge of the industry we represent and the experience that we bring together as a team to be able to offer something that has never been offered in our industry before. Understanding the market and consumer behaviour is crucial! Therefore, we specialize in matching your products with the right buyers. We consider ourselves a turn key solution from the manufacturing floor to the consumer's cupboards. We relentlessly pursue breakthrough ideas for products and direct marketing approaches. We strive at being the leader in every market we serve. Joel LaPalme and Associates Inc. can help you drive your business to the next level. We have Associates that are experts in their fields internationally and are available to work with you and your company. It all started at the age of sixteen, in his hometown of Haileybury, Ontario, where Joel started working at the local IGA. From there his love of the retail industry grew and led him to eventually move on to managing and directing companies such as Price Club/Costco, Business Depot/Staples, Loeb/Metro, LCBO and Aurora Importing. He has been highly sought after for his technical skills, industry reputation and real world experience which has enabled him to reach retailers and persuade consumers. In business today you need to do more than only sell! You need to manage! Joel is a "no holds barred" forward thinker. Today Joel and his associates are helping companies by getting their products to market. Every detail from showing your product line to retailers, looking at how to increase your sales, helping stores with merchandising, to building an advertising program to training your sales people; Joel and his associates deliver quality service. Joel also is available for speaking engagements. 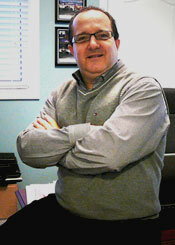 His specialty is sales and managing in the retail industry. Book Joel today and earn more tomorrow! Joel LaPalme and Associates Inc. represents its partners to some of the largest retailers, growers, manufacturers, food service and also ethnic stores in the Canadian and U.S market. Our reputation is based on the success of your company. You can be assured that in selling your product, representing your factory and training your sales people that we are assisting your company and people every step of the way. Below you will find a list of the companies we correlate with. No speaking engagements currently planned. If you are interested in having your product line represented, or to book Joel for speaking engagements please contact us by email using the form below.